Thinking of hiring a health coach? Learn more about working with a health coach from ACE-Certified Health Coach Debra Aplis. In addition to sharing how a health coach can help you reach your goals, Debra shares her personal health journey. This nurse was diagnosed as prediabetic and tried everything before finding what really works and now loves sharing that knowledge with others. In addition to being a health coach, Debra is also a certified Fitness Nutrition Specialist, Weight Management Specialist, has completed her Certificate in Mindfulness, and is working on a Certificate in Nutrition and Behavior Change. Her new online group health coaching program launches October 1, 2018. 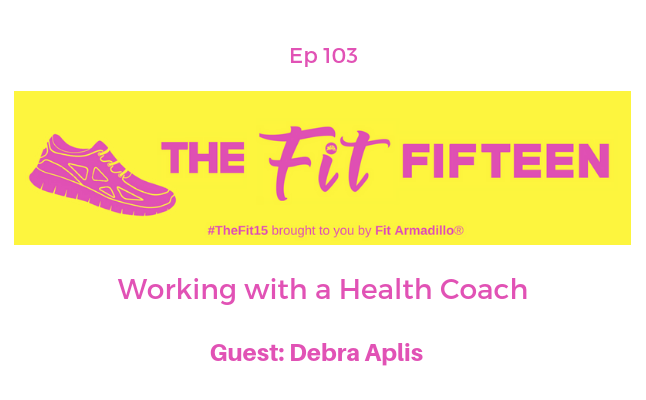 #HealthCoach Debra Aplis stops by @TheFitFifteen #PodcastShow @FitArmadillo to share her #HealthJourney and what it's like to work with a health coach.